A freight train from Alberta derailed in northwest Iowa on Friday, leaking crude oil into flooded fields flanking the tracks and raising concerns about the possible contamination of residential water supplies downstream, officials say. 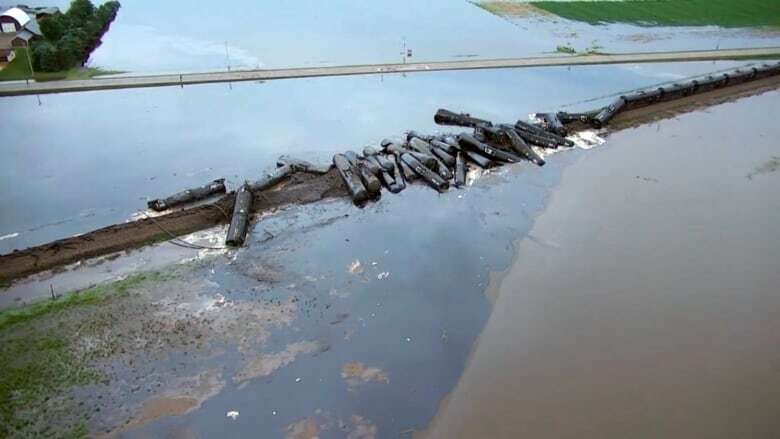 A freight train from Alberta derailed in northwest Iowa on Friday, leaking approximately 871,000 litres of crude oil into flooded fields flanking the tracks and raising concerns about the possible contamination of residential water supplies downstream, officials said. No one was injured when 32 oil tanker cars derailed around 4:30 a.m. on Friday just south of Doon, in Lyon County, BNSF railroad spokesperson Andy Williams said Saturday. Initially, he said 33 cars had derailed. The train was carrying oil to Stroud, Okla., for ConocoPhillips, according to company spokesperson Daren Beaudo. He said the derailed cars were a model known as DOT-117Rs, indicating they were newer or had been retrofitted to be safer and help prevent leaks in the event of an accident. The oil leaked from 14 of them into floodwaters and eventually into the rain-swollen Little Rock River, Williams said. BNSF had hazardous materials and environmental experts on the scene and had begun cleanup within hours of the derailment, Williams said. "We are containing the oil that was spilled as close to the incident as possible using containment booms and recovering it with skimmers and vacuum trucks," he said. Williams said nearly half the spill had been contained with booms near the derailment site and an additional boom placed approximately eight kilometres downstream. There are concerns the spill could travel as far south as Omaha, Neb., about 240 kilometres from the derailment site. Omaha's public water utility said it was monitoring pumps it uses to pull drinking water from the Missouri River. Williams said that containment site will be cleaned up using special equipment that can separate oil from water. Lyon County Sheriff Steward Vander Stoep said between 30 and 40 semi-trailers containing cleanup equipment were at the scene. A major part of the cleanup work includes building a temporary road parallel to the tracks to allow in cranes that can remove the derailed and partially submerged oil cars. Officials at the scene agreed that floodwater from the swollen Little Rock River played a part in causing the cars to leave the tracks, but said they weren't yet sure whether the waters compromised the track, physically pushed the cars off it or played a part in some other way. The river rose rapidly Wednesday after 13 to 18 centimetres of rain fell Wednesday and a further downpour on Thursday. A broadening sheen of oil spread near several of the tankers, which had piled up across the track and earthen berm, some submerged in the water. Vander Stoep said that drinking water in Doon and the immediate area didn't seem to be in danger of contamination. But news of the spill was enough to prompt officials in Rock Valley, a small city about eight kilometres southwest of the derailment, to shut off all the city's drinking water wells. The water towers also will be drained as a precaution, said Rock Valley public information officer Travis Olson. In the meantime, the city is getting its water from the nearby Rock Valley Rural Water system, which Olson said is not in danger of being contaminated by the spill. The city, with a population of nearly 3,400, will stay on the rural water system until testing by the Iowa Department of Natural Resources confirms the safety of the city's drinking water, Olson said. "I don't know how long that will be," he said. "It sounds like the cleanup is going to take a while." The railroad will focus on environmental recovery. Williams said "ongoing monitoring is occurring for any potential conditions that could impact workers and the community and, so far, have found no levels of concern." Vander Stoep said the oil was being carried downstream into the Rock River a few hundred yards west of the derailment. Vander Stoep said four homes near the site were evacuated. The Rock River had already carried some oil to Rock Valley by midmorning, said Ken Hessenius with the Iowa Natural Resources Department. State crews were trying to determine how fast the oil was travelling south. The Rock River joins the Big Sioux River before merging into the Missouri River at Sioux City. The task difficulty is compounded by the spreading floodwater, he said. "The river, instead of being 100 yards wide, is now maybe a half-mile wide" in spots, Hessenius said. "Our first major concerns are public water supplies," he said, adding that several towns that draw water from shallow wells near the Rock River have been alerted about possible contamination. Doon is about 65 kilometres southeast of Sioux Falls, S.D., where several rain-swollen rivers overflowed Thursday. The National Weather Service has forecast flooding in the area into the weekend.